white magnetic material with a PVC pocket heat welded to the material – simply slip in a new piece of paper or card to update the text. 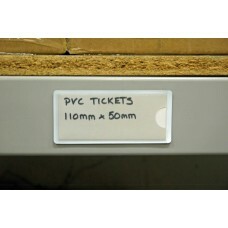 Incredibly durable and a nice neat solution to either point of sale, machine marking or warehouse labelling. Standard sizes 110mm x 25mm, 110mm x 50mm (card included in each piece). To buy this product please contact our sales team on 01283 531000 who will be happy to help you. 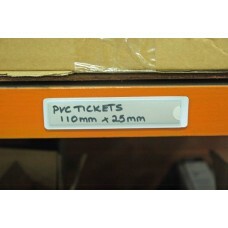 An ideal solution for long bay labelling – available in 50 metre rolls in widths of 20mm, 30mm, 40mm or 50mm wide. Simply cut to length with scissors or allow us do it professionally, then insert the card and acetate cover (available separately) to provide a flexible solution to your labelling problem. We can slit a roll of white vinyl into any width for you to simply keep on hand – cut the material to the appropriate length with scissors and write on it with marker pen. Create a magnetic ‘back sign’ onto which you can adhere moveable magnetic signs from standard white vinyl material, allowing you to change product locations within a warehouse for example. PACK OF 100 White magnetic material with a PVC pocket heat welded to the material – comes with a ..